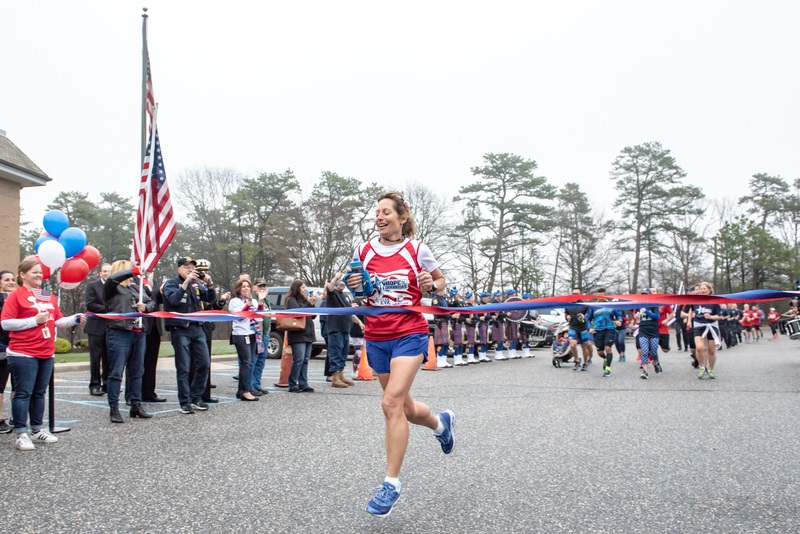 Suffolk Federal’s Vice President of Information Technology and extreme distance marathon runner Eva Casale heightened awareness for our veterans and raised almost $30,000 in support of Hope for the Warriors. Eva completed seven marathons, with extra stops amounting to more than 194 miles, over the course of seven days. Each day’s marathon focused on honoring local servicemen killed in action and was linked to the communities they called home. 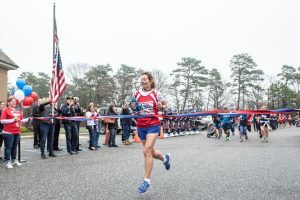 The team delivered over 184 flowers at Points of Honor during the 7-day program and the public was also able to participate in the final 3.1 mile leg of her journey at the end of each day. Suffolk Federal once again supported Eva’s mission by serving as lead sponsor, a commitment which further strengthens the Suffolk Federal mission to support Long Island’s residents. “It was an honor to support Eva with her efforts to raise funds and awareness for the brave men and women who have served our country and have given up so much to defend our freedom. At Suffolk Federal, we feel that it is our responsibility to show the same dedication and commitment to our veterans and their families that they have shown to serving our country,” explained Ralph D. Spencer Jr., Suffolk Federal’s President & CEO and a United States Air Force Veteran himself. For the first time this year, Team E.V.A. expanded its efforts into Nassau County. Founded in 2006, Hope For The Warriors is a national nonprofit dedicated to restoring a sense of self, family and hope for post 9/11 veterans, service members and military families. Since its inception, Hope For The Warriors has served approximately 10,000 through a variety of support programs focused on transition, health and wellness, peer engagement and connections to community resources. The nonprofit’s first program, A Warrior’s Wish, has granted 162 wishes to fulfill a desire for a better quality of life or support a quest for gratifying endeavors. In addition, Run For The Warriors has captured the hearts of more than 22,000 since 2010. For more information, visit http://www.hopeforthewarriors.org/, Facebook or Twitter. PHOTO: Extreme distance ultra-marathon runner Eva Casale completed an incredible seven marathons in seven days as she led her team to the final marathon finish line at Suffolk Federal Headquarters in Medford. Eva ran over 194 miles to raise funds and awareness for Hope For The Warriors during her “Every Veteran Appreciated Week” which took place from April 21 through April 27. Each day’s marathon focused on honoring local servicemen killed in action and was linked to the community they called home. Eva and her team delivered over 184 flowers at Points of Honor throughout Long Island during her 7-day journey to honor those who sacrificed their lives for our freedom. She paid respects by placing a single rose, a cone of flowers or a wreath at each location. PHOTO: Many highlights occurred during the Team EVA 7-Day Marathon and included a warm welcome as the Team entered Copiague. The Team was enthusiastically greeted by the Copiague High School Track Team and Cheerleaders as they arrived to visit Copiague Points of Honor. 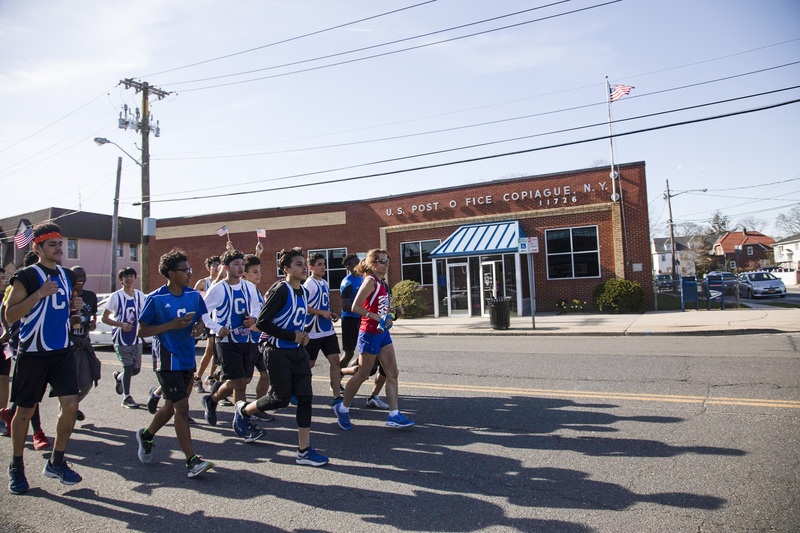 Enthusiastic Copiague High School students accompanied Eva as she traveled through Copiague. The Team was also greeted by the community to a surprise “Welcome to Copiague and Support of Our Veterans” reception as the Team left flowers at Copiague’s Veterans Memorial Plaza.